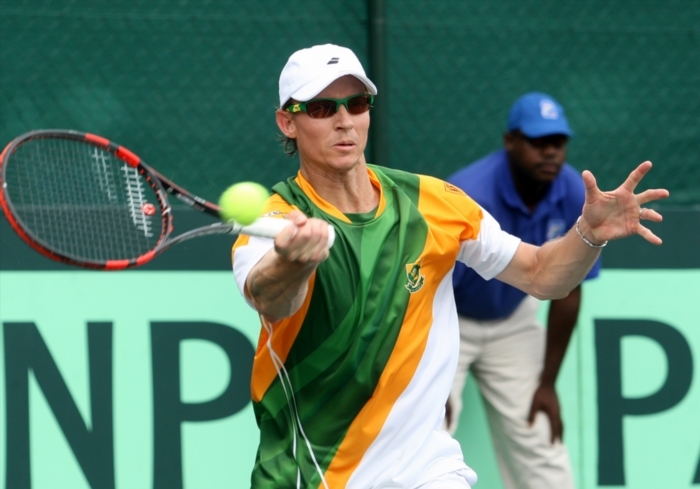 FILE PICTURE: Rik de Voest of South Africa in action against Benjamin Balleret of Monaco during the Reverse singles of the Davis Cup tie between South Africa and Monaco at the Irene Country Club on February 02, 2014 in Pretoria, South Africa. Picture: Reg Caldecott/Gallo Images. De Voest’s ranking plummeted on Monday from last week’s 190th place to 261st position, emphasising, in the process, the superior rankings of the Lithuanian players going into the tie that gets underway on Friday. Lithuanian number one Ricardas Berankis has improved his ranking by one place to 143rd, while the country’s number two, Laurynas Grigelis, at 234th, is also ranked higher than any of the potential South African singles players. The number two South African singles player behind De Voest will, in all probability, come from either Dean O’Brien (516th) or Ruan Roelofse (744th). However, De Voest has explained that the birth of his first child resulted in him withdrawing from the qualifying rounds of both recent ATP Masters tournaments at Indian Wells and Miami and surrendering a sizeable drop of points as well. “I was actually already busy practising at Indian Wells when I heard the news of the impending birth and immediately returned home, missing out on the Miami tournament as well.” said De Voest. But the long-time South African Davis Cup stalwart, who will be required to play a key role if South Africa are to keep alive the hope of qualifying for the Euro-Africa Group One segment of the Davis Cup next year, said he had resumed intensive practice and was hoping to recapture his best form against the Lithuanians. De Voest will also be boosted by the fact that he learnt his tennis as a youngster while a member of the Irene Club and will be feeling “as though I am returning home” at the venue on the outskirts of Pretoria. More encouraging news from Monday’s ATP rankings for South Africa is that the country’s top doubles player, Raven Klaasen, has reached an impressive career-best ranking of 26th – considerably better than any of the other players in either team who will be competing at Irene. In what is expected to be an evenly contested tie in which South Africa will benefit from home-court advantage, the doubles could prove a deciding factor.